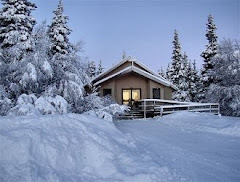 Wednesday, October 28th, 2009 I flew to Ugashik (yougashick), Alaska. I needed to touch bases with Hattie Albecker a resident Catholic who lives year around in the village. Hattie took this picture of me standing in front of our airplane at the one-and-only Ugashik airport. The Temp was about 15-20 degrees F. so I put on my engine blanket. LOCATION: Where is Ugashik? Ugashik is one of those ultra small fishing villages near the beginning of the Aleutian Chain (year around population about 9). 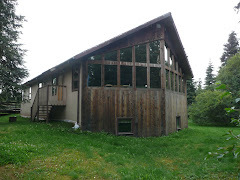 It is located about 70 miles south of King Salmon near the coastal village of Pilot Point. As the crow flies (according to my GPS) Ugashik is exactly 97.7 miles from Dillingham, Alaska. 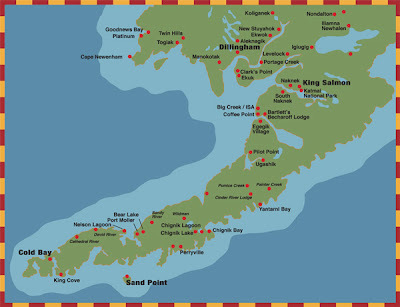 Here is a map that is in the Penair terminal in King Salmon. It shows the Bristol Bay water between Dillingham and Ugashik (CLICK TO MAKE LARGER). This map also shows the entire Holy Rosary Mission Territory. History: Ugashik has a long history dating back thousands of years. Native Indians hunted and fished in this area. Arrowheads are still around on the ground. If you are ever in Ugashik, be sure to ask Hattie about the extra-ordinary history of the village. To learn more about Ugashik, CLICK HERE. Flying to Ugashik: Flying directly to Ugashik from Dillingham is about 100 miles with at least 50 miles over water. Flying direct is not recommended in our single engine Cherokee Warrior II. If the single engine should falter the only alternative would be to land on ice cold water and freeze to death in a few minutes. So I take the long way around: east from Dillingham to Grave Yard, which is at the mouth of the Kvichak (kwejack) river, then directly south down the Alaskan Chain past Peterson Point, Naknek, and Egegik. This route adds an additional 20 miles or so to my route. SURPRISE: When I was ten miles to the north I called Ugashik three times to alert people I was going to land, twice on the aviation frequency 122.9 and once on the Marine radio channel 18. I received no response. Come to find out when I was talking on 122.9 Ugashik tried to answer but I was already talking on channel 18. To make a long story short, all they heard was “landing in Ugashik.” After buzzing the small village at about 700 feet I landed and to my surprise was met by a group of people. It looked like half the town came out to meet the Catholic Priest, me. WRONG. They thought I was Penair and were trying to get back to King Salmon. Solar and Wind Power: After introducing myself as Father Scott to the small disappointed greeting party, the villagers warmed up to me and gave me a ride back to Hattie’s office. On the way I saw two windmills and a solar panel. Ugashik is way ahead of most villages with regard to alternative energy. Here are the twin windmills in Ugashik. Notice the solar panel in the background. This picture was taken out the back of Hattie's office. The wave of the future in Ugashik, Alaska. Beluga Whales: While chatting with Hattie in her office, Victoria dropped by. The three of us looked out the window and watched Beluga whales breaching in Bristol bay. What a magnificent sight on a beautiful day. 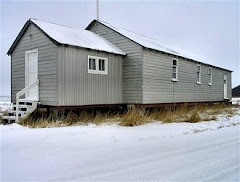 After seeing the newly built office, which consisted of a kitchen, weight room, and living quarters for visiting priests like me, or whoever, Hattie drove me back to her house. If you click to enlarge you can see the whales swimming. I took this picture out the back window of the office building. Well, maybe you can't see them! Hattie and Victoria pose in their office for a picture. Penair and Mary: Driving up to Hattie’s house I met her husband William. He was on his way out, for the second time that morning, to meet the Penair flight. 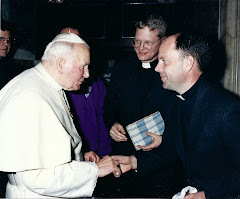 This time it was actually Penair not me, the Catholic Priest. Mary, a commercial pilot for Penair, landed the Cherokee Saratoga shortly there after and flew the Ugashik villagers to King Salmon. Baptisms over Coffee: Hattie and I talked over coffee for about an hour. We planned some possible baptisms in Ugashik (we may have a few this year, there had only been one other catholic baptism in the history of the Ugashik village). We talked about a village reunion in December around Christmas and the possibility of me flying out to offer a mass. We talked about Hattie’s daughter who is currently, get this, a Polar Bear watcher on the North Slope. 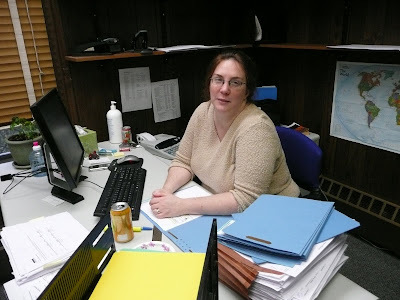 She drives around the work area in a truck on pure ice, finds Polar Bears, and puts the work force on alert if the bears get too frisky. What a great job to have in Alaska! 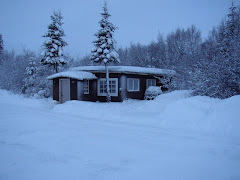 Here are a few more pictures from the small village of Ugashik. Also looking out the back door of the BBNA office is Hattie's project. I think she wants to restore that old boat. 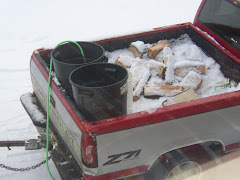 Water and fuel storage is an important part of village life in Alaska. These large tanks look like they may be listing a bit to the starboard side. Another view of the storage tanks. Some of the scenery along the road in Ugashik. Alaska. 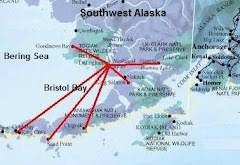 As my flying skills increase I hope to fly further down the Aleutian chain to places like Port Heiden, Chignik Lagoon, and Cold Bay (see the map above). After coffee and a homemade cookies (Hattie did not have time to make her Alaskan Bush renown cinnamon rolls) she dropped me off at the small gravel strip. Bye for now and fly safe out there! Every parish has ministers. 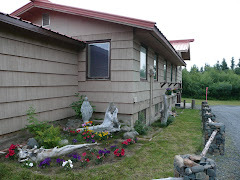 At Holy Rosary parish in Dillingham nearly every parishioner is a minister and practices stewardship in one form or another. Here are a few members of Holy Rosary Catholic Church who have brought "Stewardship" to a whole new level. All our ministers are volunteers. Dr. Dan (general practitioner) and Dee O'Connell just rode their bikes to Mass in freezing snowy weather. These two are very athletic and very helpful around the parish. Currently they are Extra-Ordinary Eucharistic Ministers and Dee is the minister of linen...she has washed and ironed linen long before I arrived in Dillingham in 2005. Dan has just received National recognition for his medical service to the native communities. Jackie Chase is one of our un-sung heroes. At Holy Rosary people volunteer to clean the church for an entire month. Jackie is always on the list for at least a few months every year. Part of cleaning the church involves hosting a fellowship with food and beverage after every Sunday Mass. Spruce is our music minister (councilor at the hospital). She has many God given talents including singing, piano, flute, and violin. 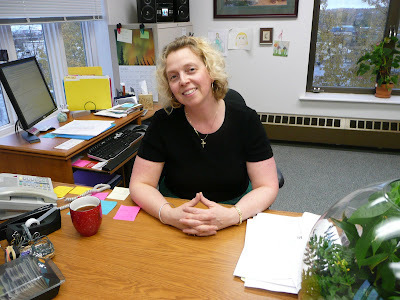 She is continually working on bettering the music at mass. She came to us last year from Bethel, Alaska. Spruce has just received National recognition from the Department of Veterans Affairs for her creative talents. Here are, from left to right, a few of our "chomping at the bit" altar servers, Brian, Anthony, and Walter. Alter server 2 takes care of the "4 Bs" book, bottle (water), bell, bowl (water) and altar server 1 is "EE," everything else. 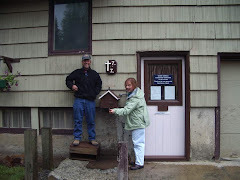 Bernie Venua (Nushigak Electric employee), here posing with his wife Angie (our accountant, see below), has helped with numerous maintenance projects around the parish and rectory including installing new windows, fixing the water tank, and building a rack for the linen. Bernie is always lending me tools and, oh ya, I still have a couple I need to return. 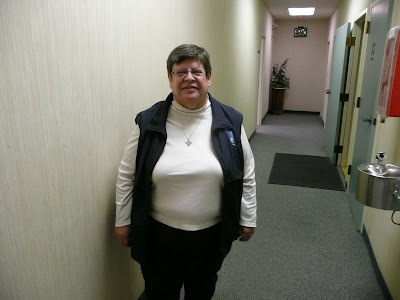 Pat Durbin is the lead maintenance worker and extremely valuable to our parish. He does everything from sheetrock, to plumbing, to electrical work, to mowing the cemetery. A great guy to have around and what a kind hearted and generous person! Angela Clark (left), has single handedly spear headed the Blessing of the Dillingham fleet every year. It is a lot of organizing and hard work. 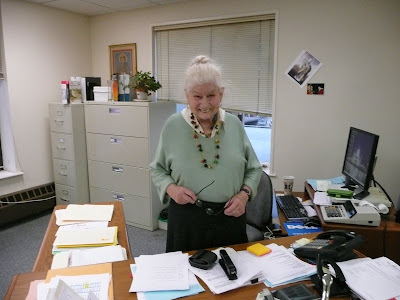 She is also on the Archdiocesan Pastoral Council. 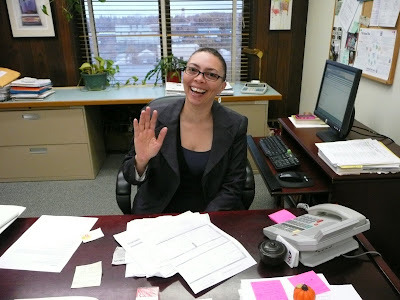 Next to her is Angie Venua (Nushigak Accounting employee), our Accountant. 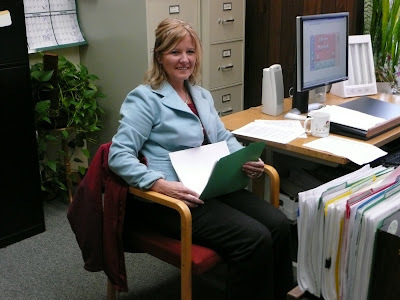 Angie has donated many hours of her time to help Holy Rosary with the Logos Accounting. 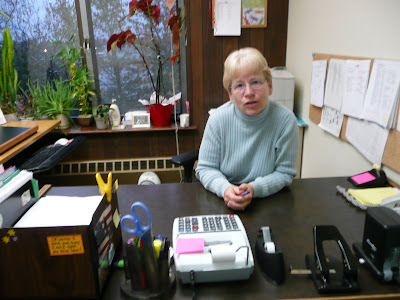 She handles all of the accounting and book keeping for Holy Rosary and Saint Theresa. 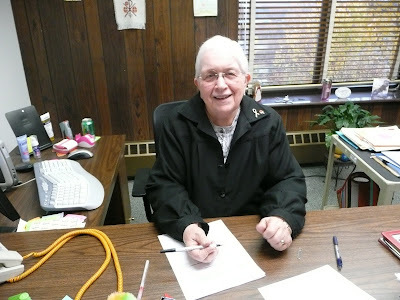 Patrick (Fish and Game) and Aileen Walsh are two more valuable assets to Holy Rosary mission. Aileen prepares to offer a Communion Service every Sunday in case the weather turns bad and I get stranded out in the bush. Patrick takes care of the grounds around the church, mowing, fertilizing, and trimming the trees. Michael Swaim (Fish and Game), is one of our four lectors. He does an excellent job of reading. His wife, Dianna (not shown because she was sick when I took this picture) counts the Sunday collection every week and deposits it at the Wells Fargo bank. Their daughter Katelyn (five years old) brings up the gifts with several other children. Kristen is one of the few teens we have in our parish this year. 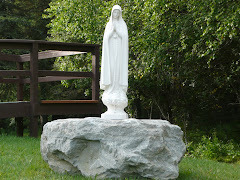 She has helped to increase those numbers by inviting her non-Catholic friends to accompany her to mass every Sunday. Kristen was Confirmed in 2007. Dr. Matteo Guarino is our artist. He has created some beautiful art work for Holy Rosary Catholic Church. 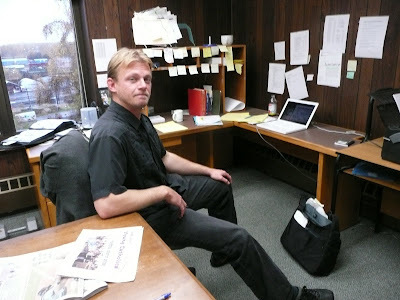 He is currently working on some pictures of the mysteries of the Rosary. He has completed the Annunciation and is working on the Visitation. He is a pediatrician at the Hospital. Stewardship is not just a seasonal experience where we make a special effort to donate a little extra money to the church. It is a life-long commitment of utilizing the talents God has given us to build up the Kingdom of God. Stewardship means acknowledging that God has made each of us special and that our unique talents, together with our neighbor’s talents, can make our world a better place to live. Thank you everyone at Holy Rosary Mission for being great stewards! To shoot some Alaskan Bush Pilot footage, Wes Woodland, a producer and editor from Los Angeles, flew along with me in our Cherokee Warrior II so he could interview Tommy Tucker of Tucker Aviation. 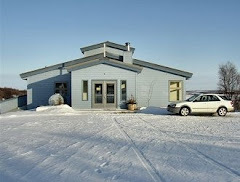 We flew to a small village near Togiak, Alaska called Twin Hills, which is about 40 miles Northwest of Dillingham. Wes (left) and Tommy pose for a shot in the Tucker Aviation hanger before we fly off to Twin Hills. To get to Twin Hills one must fly through a mountain pass. I followed Tommy's Cessna, we switched to an unused frequency, and he told me where to plot the way-points on my GPS to make a safe journey through the pass. This was valuable information for me in case I ever get stuck in bad weather going to Togiak and back. Shown below is a shot of Tommy's Cessna taken from our Warrior II before we enter the mountan pass. After landing on the small gravel strip in Twin Hills, Tommy helps the dentist and her assistant unload dental supplies. He will return to pick them up in a few days. More villagers arrive to help tranfer the load. Wes gets an interview with Bush Pilot Tommy Tucker. Here is the beautiful little village of Twin Hills. Here are the actual hills the Twin Hills was named after. 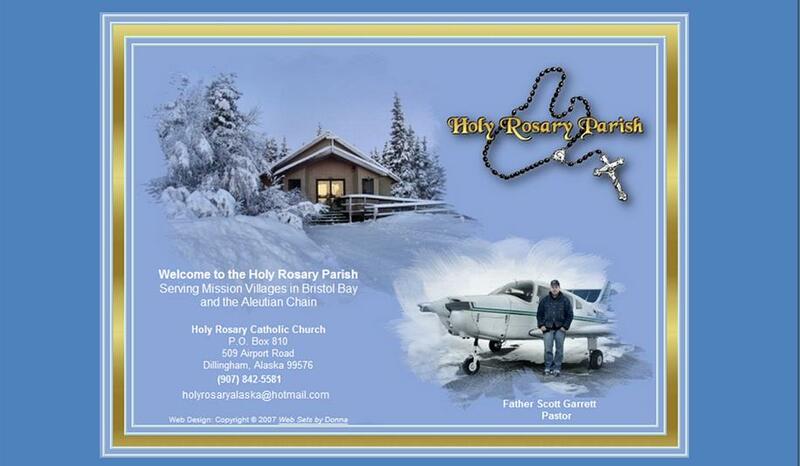 After following this blog (http://www.holyrosaryalaska.org/) for six months, Wes Woodland is in the process of shooting a TV show on Bush Pilots. Wes’s normal day job is working at the, get this, DR. PHIL show in Hollywood! Specifically, Wes wanted to follow around a flying Alaskan priest, which is a rather rare breed of bush pilot. In fact, I may be the only flying priest around. The 41 year old Wes, after he and his partners proposed their concept to the cable networks, were sent out here to Bristol Bay to do a story on bush pilots. Wes can do it all, shoot, produce, edit, you name it, this guy is super qualified and a great guy. Saturday, October 17, we flew from Dillingham to Clarks point (to give communion to Louise Gardener), then to Levelock for Mass with Mary Ellen and the Bowden family, then to King Salmon and Naknek. We hit a snow squall along the way and the visibility went down to about two miles and we were at 700 feet...typical weather for around Bristol Bay. Wes stayed overnight in the Antler Inn at King Salmon. The next morning after the 9:00 AM Mass at Saint Theresa, we headed for the Cherokee Warrior II, which was parked at the East ramp. We flew back to Dillingham for Mass at 12:30 PM. The weather was nearly perfect, something we do not see much of around here. 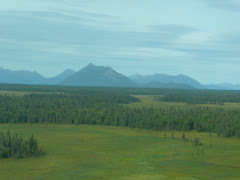 Here are a few photos I took while we were flying around the Alaskan bush. 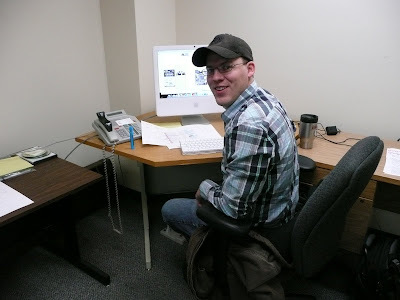 In the first picture Wes is getting ready for the journey from Dillingham Airport out into the great Alaskan Bush. After arriving in Levelock Wes is at a loss. Now where is that Camera? George patiently waits as Wes, after finding the camera, gets ready for the trip on the back of a 4-wheeler to the Bowden house where we will have mass. Mary Ellen, a teacher in Levelock, Alaska, tells Wess an amazing story about an experience she had living in this small Alaskan Village. Napatie and children Benita and Joanna prepare us a sandwich before we take-off again. Wes, at the controls, gets the feel of being a real Alaskan Bush Pilot. He piloted the aircraft from around Portage Creek to a couple miles out of Dillingham. Michael Swaim and Wes discuss shooting wolves and bears with dart guns out of helicopters. What a shoot that would be! To celebrate Wes's visit, we had a big Potluck after Mass. Thank you to everyone who was involved with the filming, especially Judy and Louise at Clarks Point, Mary Ellen and the Bowdens at Levelock, and the Catholic communities of Saint Theresa and Holy Rosary. 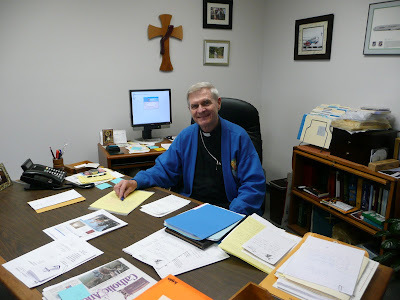 Each month parishes from around the Archdiocese of Anchorage pay a certain amount of taxes to the chancery (the chancery is also known as the pastoral center). The money to support the chancery comes from all of you who make donations to our Sunday collection. That's right, on a monthly bases every parish pays a 15% tax to help run the chancery. Additonal financial supporrt comes from the archdiocesan annual appeal entitled, "One Bread One Body." What does "help run the chancery" mean. One can make a good guess by reading each staff members job title. 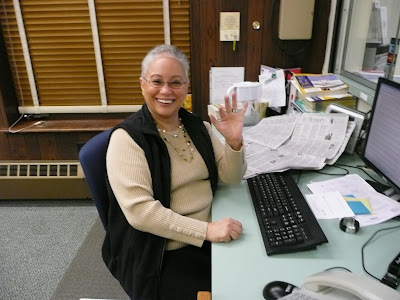 At the chancery there is a vast amount of work that goes on behind closed doors...work that is crucial to the livelihood of our Catholic Church. 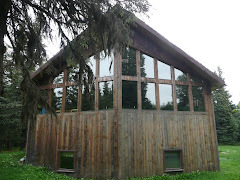 It is my observation, after talking with many of the staff members, that the 15 percent tax Holy Rosary pays each month to our headquarters in Anchorage is put to very good use. If you have any questions or concerns, give them a call! 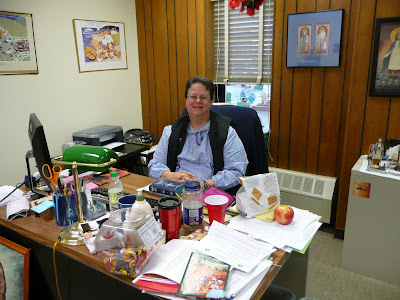 Those with questions about Native Ministry can contact Sr. Donna Kramer, D.C. (Daughters of Charity) 297-7777. 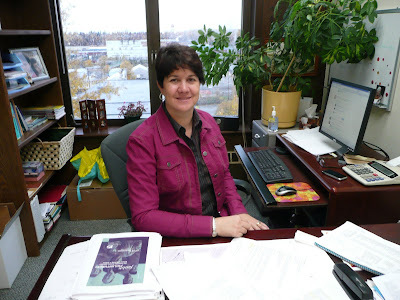 All the Archdiocese of Anchorage staff members are listed below. To speak with any of these staff members, either dial them direct or call Dulce at 907-297-7700 and she can patch you through.